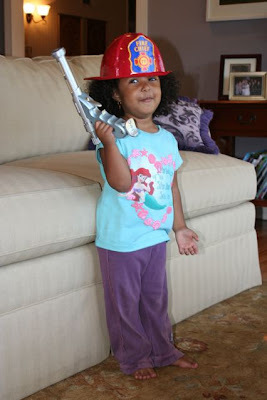 You know I try to dress her all girly and then she runs around the house like this, pointing the gun at me and yelling, "Mama you're under arrest!!!" It's not obvious she has two brothers, is it? Yeah, but she is DARN cute! I almost said darn tootin cuz I just got done watching the HILARIOUS clips below!! Awww.... It's great that she gets a well balanced life with her two big brothers. your purple house is waaaay cool. did you paint it that way, or did you buy it that way? hehe. even before I read your words, I thought to myself, "Now there's a sweet young thing who has BROTHERS!!!" I only wish we lived closer (me there not the other way around) so our girls could be friends! Marlie is just too cute for words! With my daughter it was always action figures-- she'd grab her brothers Batman or Wolverine and then Barbie would rescue THEM...BAHAHAHA My dad also bought her this tiny gun-- like the women used in the old west...yea, funny dad. I luv, luv, luv that picture! What did you do to be put under arrest?? :) Her grin is too cute! She looks very menacing indeed! I read a little bit on your blog and I love the post several days ago on the sound effects. I knew your husband worked on movies, but I didn't know he did sound effects too. That is so cool! No to toot my own horn, but I have some pretty rad sound effects myself. The post is called "my super talent" and is featured on the left hand side of the my blog in the "my favorite posts" section. Maybe Hollywood needs me. hehe! I love her expression. It just spells mischief.